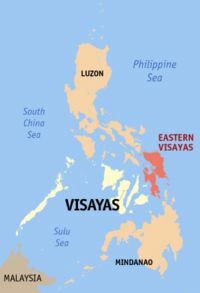 Eastern Visayas is one of the regions of the Philippines and is designated as Region VIII. It consists of six provinces, namely, Biliran, Eastern Samar, Leyte, Northern Samar, Samar (Western Samar) and Southern Leyte. These provinces occupy the easternmost islands of Visayas: Leyte, Samar and Biliran. The regional center is Tacloban City, one of two cities of Leyte. Calbayog City is the lone city in Samar, one of the oldest in the country.